APA's Plan4Health project includes 35 coalitions in 27 states working at the intersection of planning and public health. 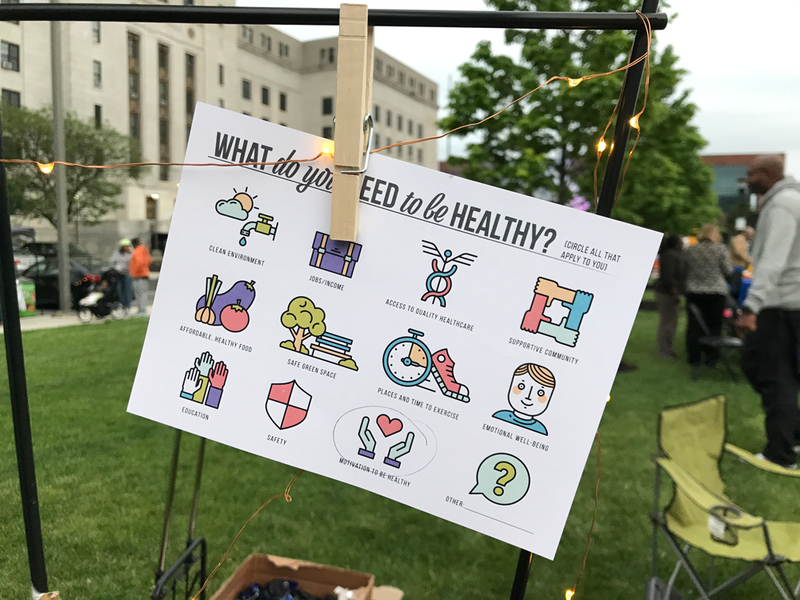 From the development of Indianapolis' first pedestrian plan to the launch of a healthy corner store program in Fort Worth, planners have engaged in strategies to increase access to healthy food or to increase opportunities for physical activity. While Plan4Health defines nutrition and active living as two separate focus areas, this distinction disappears in daily routines. If bus routes don't stop near supermarkets or if areas surrounding healthy corner stores don't feel safe, it's not any easier for community members to walk, bike, or roll to fruits and vegetables. At the National Partnership, we see an opportunity to work together with our partners focused on food access to identify strategies that make it convenient and affordable for people to walk, bicycle, or take public transit to access nutritious foods at prices they can afford. We're calling the work of overcoming the transportation challenges to healthy food access Safe Routes to Healthy Food. A lead with the Voices for Healthy Kids Community Consortium, the National Partnership has collaborated with The Food Trust to create a task force to co-develop the field of practice. APA's Planning and Community Health Center has joined Active Living by Design, ChangeLab Solutions, Prevention Institute — and many more! — to recommend strategies for stakeholders to make it easier, safer, and more convenient for people to walk, bike, and take transit to where they access food. Delaware Valley Regional Planning Commission's outreach postcard. Photo courtesy Delaware Regional Planning Commission. While Safe Routes to Healthy Food is an exciting contribution to the healthy communities movement, what does this mean for planners? Equity through Access: Equity through Access is an update of the region's Coordinated Human Services Transportation Plan (CHSTP). Equity through Access seeks to improve economic and social opportunity in the region by expanding access to essential services for vulnerable populations — those who are more critically impacted by barriers and gaps in infrastructure, service coordination, and policies. Cultivating Camden: The City's Food Economy Strategy: Cultivating Camden seeks to build off the city's existing assets by identifying opportunities to increase food access and economic opportunities within Camden, New Jersey. It analyzes the city's current food system and food economy, acknowledging the challenges that residents face in accessing healthy food, while at the same time making recommendations to grow food as an economic sector; increase opportunities for food entrepreneurs; engage Camden's institutions; and support organizations already working to increase access to healthy food, healthcare, and job opportunities. As DVRPC continued to work with other Campbell's Healthy Communities Investees to implement strategies from Cultivating Camden, they frequently heard from their on-the-ground partners that transportation was a significant barrier for many Camden residents in accessing healthy amenities like grocery stores, safe places to be active, and doctor's offices. To better understand what people need to be healthy, where they go to be healthy, and the challenges they face in getting there, DVRPC hosted multiple workshops across Camden. Although a few Camden residents attended the workshops, the majority of participants were stakeholders who worked with residents. DVRPC received good feedback from the workshops; however, they still wanted to ensure that residents currently experiencing challenges accessing healthy food had an opportunity to voice their concerns — and to propose their solutions. Leveraging Camden Night Gardens, an annual nighttime public arts festival hosted by the City of Camden and Cooper's Ferry Partnership, DVRPC went to the community. Taking the time to connect directly with residents, the team listened to and learned from community members. "It made such a difference for us to meet community members where they were and to integrate our efforts into an existing event. And, we tried to make things fun and accessible. We had residents write ideas on postcards and then attached the postcards to a string of twinkle lights. This is the type of planning we want — planning that helps residents create the kind of communities they want." For more information about Safe Routes to Healthy Foods, check out Mind the Gap: Using Public Transportation to Connect Neighborhoods and Grocery Stores or Safe Routes to Healthy Food: Where Food Access and Active Travel Intersect. This blog post was developed in partnership with Marisa C. Jones, healthy communities manager, Safe Routes to School National Partnership, and Amy Verbofsky, senior planner, Delaware Valley Regional Planning Commission. Top image: Delaware Valley Regional Planning Commission's outreach table at Camden Night Gardens in Camden, New Jersey. Photo courtesy Delaware Valley Regional Planning Commission.